Hakeem Abdul Olajuwon was born on January 21, 1963 in Lagos, Nigeria. As a young boy, Hakeem Olajuwon played football as a goalkeeper and only when he was 15 years old he started playing basketball. He moved to the U.S.A. to attend the University of Houston thanks to the recommendation of a friend of the coach of the basketball team Guy Lewis. In the first year, Olajuwon couldn’t play because he wasn’t cleared by the NCAA in time but in the following years he helped lead his team to three consecutive Final Four. Along with teammates, including Clyde Drexler, Hakeem Olajuwon formed a sort of fraternity called Phi Slama Jama for their great ability to dunk. In 1983 he was named NCAA Tournament Player of the Year award despite not playing in the team that won the title, a rare event indeed that showed his value. 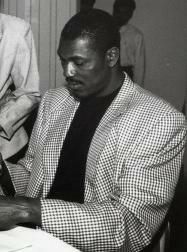 In 1984, Hakeem Olajuwon was the first overall pick in the NBA draft and went to play with the Houston Rockets along with Ralph Sampson to form the original “Twin Towers” of the league. In that same draft other extraordinary players entered the NBA but were picked after him, starting with Michael Jordan but also Charles Barkley and John Stockton. In 1986, the Houston Rockets reached the NBA Finals but they showed all their inexperience against the Boston Celtics of Larry Bird and other stars who had already played some finals together instead. The Rockets lost those finals 4-2. In the subsequent seasons, Hakeem Olajuwon had good stats but the Houston Rockets were unable to go back to the finals. Ralph Sampson had serious injury problems and was traded and the team didn’t find the right chemistry. In the 1990-91 season Olajuwon was forced to miss several games because of a fractured eyesocket suffered during a game. The following season, he skipped two weeks because of a fast heartbeat and eventually the Rockets didn’t even reach the playoffs. The relationship between Hakeem Olajuwon and the Houston Rockets management became tense and there was also the possibility that the player was traded. However, eventually there was no trade and with the arrival of coach Rudy Tomjanovich things started improving. In 1994, the Rockets returned to the NBA Finals and defeated the New York Knicks 4-3 at the end of a tough series. Olajuwon was named MVP of the finals after having been named MVP of the regular season and Defensive Player of the Year. In the 1994-1995 season Hakeem Olajuwon missed eight games due to a problem of anemia but also thanks to a a trade that brought Clyde Drexler to Houston the team managed to win their second NBA title in a row by defeating the Orlando Magic led by a young Shaquille O ‘Neal in the finals. Olajuwon was named MVP of the finals again. Hakeem Olajuwon had played for Nigeria’s junior national team, therefore, when he became an American citizen in 1993 he couldn’t play for the U.S.A. national team but for the 1996 Olympics he received an exemption from FIBA ​​and was able to win the gold medal at the Atlanta Games. In the subsequent seasons, the Houston Rockets were unable to return to the finals despite the arrival of Charles Barkley in 1996 and Scottie Pippen in 1998. In 2001, Olajuwon was traded to the Toronto Raptors and in 2002 he decided to retire due to back problems. Hakeem Olajuwon, nicknamed The Dream in Houston, was famous for his Dream Shake, a series of moves near the basket improved over time performed with great speed and coordination. The Dream Shake put in huge trouble the defenders, who were put off balance by his fakes and spins. Today he still teaches young frontcourt players how to move near the basket and in 2008 he was inducted into the Naismith Memorial Basketball Hall of Fame, one of the many awards received by a really extraordinary player.